If you want a modern villa that will leave you and your friends speechless, book Cascade. 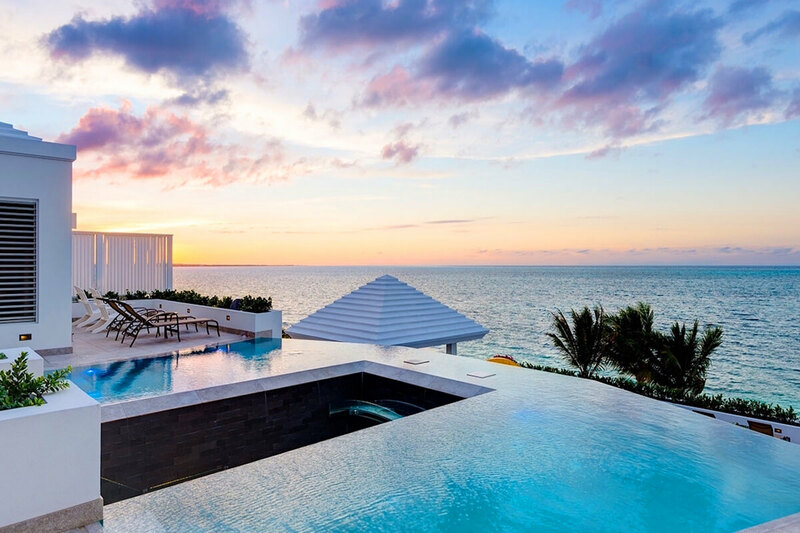 The pools here come together to make an aquatic masterpiece that almost steals the show from the turquoise ocean outside your windows. Take in the waters all around you from any of the villa’s three decks or six bedrooms, which all have outdoor showers and private terraces. Time on the beach is easy with beach chairs, towels, umbrellas, and kayaks. An architectural gem with unbelievable views! Cascade Villa rests front and center on Babalua Beach, with three stories of terraces, ocean views, and luxury. This beachfront vacation rental is ideal for couples, with chic decor and an elevated perch above the sea. The villa gets its name from its design: the water from the upper infinity pool cascades into the wading pool and wet bar on the lower level. On the uppermost level, guests can relax into love seats and loungers or swim in the infinity pool. On the middle level, children can splash in the wading pool while adults enjoy a cocktail from the swim-up bar. There are loungers and dining tables so guests can spend the whole day soaking up the sun. On the lower level, adirondack chairs face the ocean for gazing at the view. Just below that, two lengthy sectionals border the fire pit and a set of stairs leads down to the beach. Amidst the four levels of outdoor space, guests can grill on the BBQ, nap in sunbeds, and dine al fresco. Cascade has snorkeling equipment, kayaks, and paddle boards so guests can enjoy the villa’s prime location near one of the world’s largest barrier reefs. There’s even hammocks strung up between palm trees on the beach so guests can have the quintessential tropical experience. The villa’s entryway opens into the upper level living room, which has lots of seating, a flatscreen TV that can turn 360º, and two desks to work at. The formal dining room sits on one side with a massive table, and the chic kitchen sits on the other with a breakfast bar and stainless steel appliances. These rooms each open to the covered deck, which has couches and a dining table. Two bedrooms sit on this level, each with a king-sized bed, an ensuite bathroom, and an outdoor shower. Both bedrooms open to their own section of the deck on opposite sides of the pool. The majority of the middle level is outdoors, with two pools and a covered deck. Both of the bedrooms on this level open to the deck, each with king-sized beds, ensuite bathrooms, and outdoor showers. On the lower level, there are two bedrooms that each open to the beach deck. Both bedrooms have a king-sized bed, ensuite bathroom, and an outdoor shower and bathtub. Cascade is tastefully designed and decorated with plenty of windows to take in the view. Cascade is only a short drive away from restaurants and grocery stores, although there’s scarcely any need to leave the villa. Car rental, private chef, butler, server, grocery and beverage shopping (pre-arrival and during your stay), liquor and wine delivery, nanny service, baby equipment, spa services, yoga and personal training, photography, and private airport transfer/car service can be arranged for an additional fee. Any A/C overage will be an additional fee. We spent an amazing week at Cascade Villa along with 4 other couples. Everything from the booking process with Andrew, the condition of the home, the location of the property, and the service from Alex and his team were nothing short of amazing! When you walk through the front door and observe the view over the infinity pool, realize the breathtaking moments have only just begun. This home has impeccable details that consistently bring the beautiful outdoors into the home… whether it be from the views, the amazing outdoor showers, or the many outdoor areas on multiple levels. We plan to rebook again next year, with one fundamental alteration… we’ll book 2 weeks instead of 1! Andrew was extremely responsive, professional, and offered many great tips ranging from advice on booking services to making reservations. Andrew represented the initial impression to a vacation that was brilliantly enjoyed! Our group loved all 6 identical bedrooms and the incredible outdoor showers. The view was awesome. It is great to be able to walk out to the beach and enjoy the hammocks, lounge chairs, and all the water toys. The multiple levels of outdoor living space was a huge advantage. Even with a large group, there is always a place to find privacy to sit and read or enjoy the sounds of the beach. When we did have a few minor issues, like one of our bedroom safes not working, Alex came right over and took care of it. The living area opens up to the ocean breeze, and we took advantage of that every day. We even brought a corn hole game with us, and actually played on 3 different levels over the course of the week. It was a spectacular experience and we plan to return. We received great service before our visit with Andrew and our host Alex. Andrew was awesome to work with. His recommendations on the website are spot on, and I reached out for advice in several areas, and his response was always timely and excellent. From finding a chef to fishing guides to a catamaran dinner cruise to restaurant advice ... he did a great job. Our visit to Cascade Villa for my 60th Birthday will be one I never forget. The villa has breathtaking views, the snorkeling was great, and the beach was wonderful. It is fantastic for a large group of people, because the villa has everything you would need plus daily housekeeping. We could not ask for anything else, except I wish I could stay there forever, and all my friends feel the same way. I don’t think we will be able to find another villa that’s so wonderful. Andrew, as always had been a great person to work with. In the past 3 years of working with him, I am pleased to say he knows the villas and what I like. He has always made it easy to pick a villa from his knowledge of the island and villas. Cascade was everything and more than we expected. Our goal was to have family and friends all together for a week of sun, fun and relaxation, Cascade made our dreams come true! It is located on the perfect beach for walking, sun bathing, swimming and snorkeling, and the multi-level layout of the villa property is perfect for having fun as a group or sneaking away to one of the spacious rooms for an “outdoor shower” or just some quiet time. We enjoyed the accommodations so much we rarely ventured out other than to replenish “supplies” from the IGA store just a few miles away. The kitchen/outdoor kitchen made for some fun evenings and delicious meals. Demas, the villa manager, was there for us every morning refreshing our towels, linens, cleaning, and he was very helpful with information about the villa, the island, activities, etc. We did visit The Conch Shack one night for a taste of the local island fare; conch fritters, lobster, chowder and their world famous rum punch! If you’re looking for an amazing setup on one of the most beautiful islands around, we would highly recommend Cascade Villa! We have already booked it again for next year! Andrew is great, very professional and kept us informed all the way from our initial request for Turks and Caicos villa information through our booking, arrival and stay. Andrew is so knowledgeable about Turks and Caicos and all the villas that we were considering, he provided us with everything we needed for a great time, from advice on activities, excursions, restaurants, villa info, etc. There were no surprises, he is very thorough and responds quickly to any questions. Amazing 6 bedroom home with spectacular views and equally appointed amenities. Cascade Villa was definitely designed with larger groups in mind and for those seeking five-star conveniences. Each of the 6 master bedroom suites provide equal luxury, spectacular ocean views, and a private retreat when needed. Spending the day on the beach snorkeling, paddle boarding, kayaking (all of which come with the home) followed by an afternoon swinging on the hammocks provided lasting memories. We will definitely plan a return to Cascade Villa! Working with WheretoStay and particularly Andrew was an exceptional experience. Ten days before our departure we received an email and phone call from Andrew advising us that the adjacent villa we had previously booked started a remodeling project. Concerned that our experience would be no less than 100% satisfactory, Andrew suggested we may want to consider an alternative villa to avoid the sounds of construction during our stay. As one can imagine, 10 days out from our departure this call was unsettling, to say the least. What separates Andrew and WhereToStay from other management companies we’ve dealt with in the past was his honesty and integrity. Andrew did his homework prior to contacting us and had multiple options of equal or greater quality solutions. He calmly and professionally made it happen and our experience was outstanding. We highly recommend and plan to use Andrew again on our next excursion. Cascade was among 5 T&C properties that were contenders for our “neighborhood group” stay. Six couples, seasoned travelers, friends, and neighbors for 20+ years who have previously done Villa stays on several Caribbean islands. Our requirements and expectations were pretty simple: six bedrooms/baths, space for group gatherings, a working kitchen and the chance to enjoy the island environment. Andrew helped us consider our options and we narrowed to two villas pretty quickly. Cascade was the 4-2 winner of our site selection vote. Cascade delivered on the basics and exceeded all expectations. It is all about that VIEW!!! Whether in the living room, the upper pool, around the fire pit or down on the beach the view is spectacular!! The house isn’t luxurious, it is comfortable, inviting, and livable. We had some issues with the property as a result of particularly heavy rain on Sunday and the property manager (Daniel) was out with a crew to address them that day. There weren’t any “island time” excuses, things were fixed and we were able to quickly go back to enjoying the property. You can snorkel off the beach, just need to walk down a couple houses to gain unimpeded entry, kayaks and paddleboard were great. There were no disappointed travelers, rather, our only disappointment was having to leave. It may be a few years but we’ll be back to the T&C. Kudos, to chief beach officer Andrew, property manager Daniel and the owner’s of Cascade. OUTSTANDING!!! Great experience, some initial hiccups on the dates of our stay but turned out fine. Great recommendations on the chef, restaurants, and excursions. The weather was mostly spectacular as promised. Had and incredible week at Cascade Villa in Turks & Caicos. First off, Cascade Villa is absolutely amazing. Recently completed in June 2015, this villa has it all! Outstanding views from everywhere in the home, 6 gorgeous bedrooms (all with outdoor showers), sonos surround sound throughout the property, kayaks, paddle boards, hammocks, beach furniture, boogie boards, huge outdoor grill and kitchen….you want for nothing at Cascade Villa. We were greeted by Dimas at the airport and he took us directly to the property. Dimas worked at the property daily (4 hours) and was a great island resource for restaurants and activities. Turquoise blue waters just steps from the property and great reef snorkeling all around the beach. We loved our stay at Cascade Villa and will definitely be making a return visit! Andrew was fantastic. Very informative and responsive to any and all questions. Andrew was the reason we were treated to the beauty of Cascade Villa when he informed us that our original villa was going to have construction next to it during our scheduled stay. Moving to Cascade Villa was quick and easy and we couldn’t have been happier. Great experience with Where-to-Stay and I look forward to continuing our vacation rental experience together! Wonderful Vacation at Cascade Villa! Cascade is a comfortable, spacious villa, with many areas for indoor/outdoor living. The rooms are all a good size and have plenty storage so you can unpack your suitcase and get settled. The beach out front has some rocks…I would recommend water shoes,...but the lounge chairs, hammocks and umbrellas on the beach made for a nice relaxation area. The few minor issues we had were immediately addressed by Demas, who greeted us every day with a smile, clean towels and freshly made up beds. He was quite helpful! We also had Chef Becky from Sea Salt Catering cook for us one night. The lobsters were to die for! We spent most days in the top deck pool because it got more sun and was warmer…the view from there is spectacular! All in all it was a perfect stay in a beautiful villa. Sharon was super helpful! I’m very happy she told us about the construction next door to our first villa choice. We went by to check it out and would definitely not have been happy there. Good call, Sharon!